Upon hearing ‘inflatable slides,’ people’s minds typically wander to the bounce house rentals that have been popular at community events and birthday parties. Although they come in many different shapes, sizes and themes they are all essentially built upon the same kid-friendly concept. FreeStyle Slides has been expanding that concept of an inflatable slide that appeals to adults as well. “We wanted to create inflatables that deliver the same thrills as permanent, state of the art, amusement park rides,” says Stephen Philp, owner and founder of FreeStyle Slides. The concept has caught on and in the first week of December, a ‘pop-up’ water park is set to open in Perth, Australia. “Xscape at the City is only temporary, but we want the adrenaline and thrills to last a lifetime,” explains Nasir David, president of Perth-based Amusement Leisure Consultants, which conceived the project. Amusement Leisure Consultants turned to FreeStyle Slides to help with the park, as they had already created the world’s tallest drop slide, called the FreeStyle Hybrid Slide. The Hybrid Slide was developed two years ago. The slide is versatile – it can be attached to an existing building, or freestanding structure, and can be moved from location to location. It is designed to run into existing bodies of water, man made reservoirs, or FreeStyle’s inflatable extension run out and landing bed. 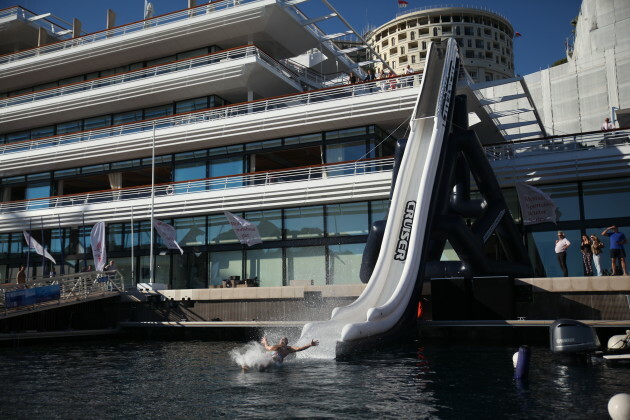 The Hybrid Slide made its first public appearance at the Yacht Club de Monaco and has been a popular addition to Yacht Club events, from sailing races to the reception of the Royal Wedding that took place a few months ago. For more information on the water park in Australia, or any of FreeStyle Slides products, visit their booth at IAAPA (#1332), visit www.freestyleslides.com, or email info@freestyleslides.com.